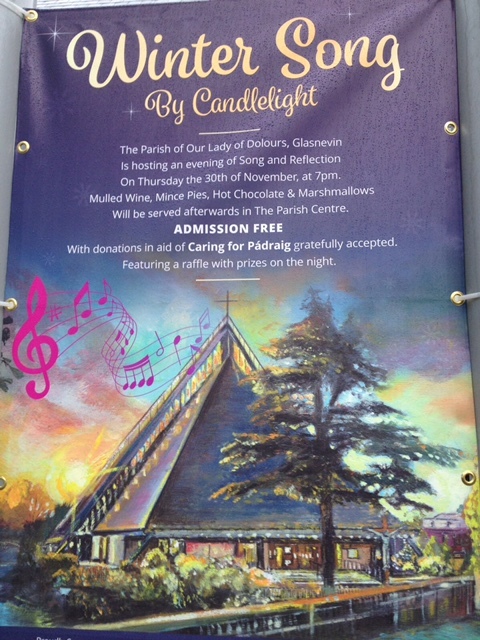 Our neighbouring parish decided this year to organise a raffle at their annual Winter Songs by Candlelight to support “Caring for Pádraig” which is so incredibly generous that I honestly do not know what to say… It’s the Parish where we got married a few years ago and it will be a great honour to join the Parish on that evening for what, no doubt, will be a brilliant night of song and good company. Sadly, we also had some bad news. Last night, Gabrielle Carty, one of our longest family friends and former DCU colleague, died. We have so many good memories of brilliant times spent in her company, memories that will always stay with us, as will she herself!